In the continuing “Mini Series” for the 3 quart Mini electric pressure cooker, I’m sharing this creamy and delicious Instant Pot Mini – Mac and Cheese. It’s a side dish. It’s a main dish. It’s a midnight snack or an after school snack. It’s comfort food. 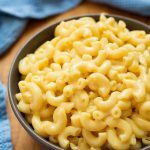 It’s Instant Pot Mini – Mac and Cheese! 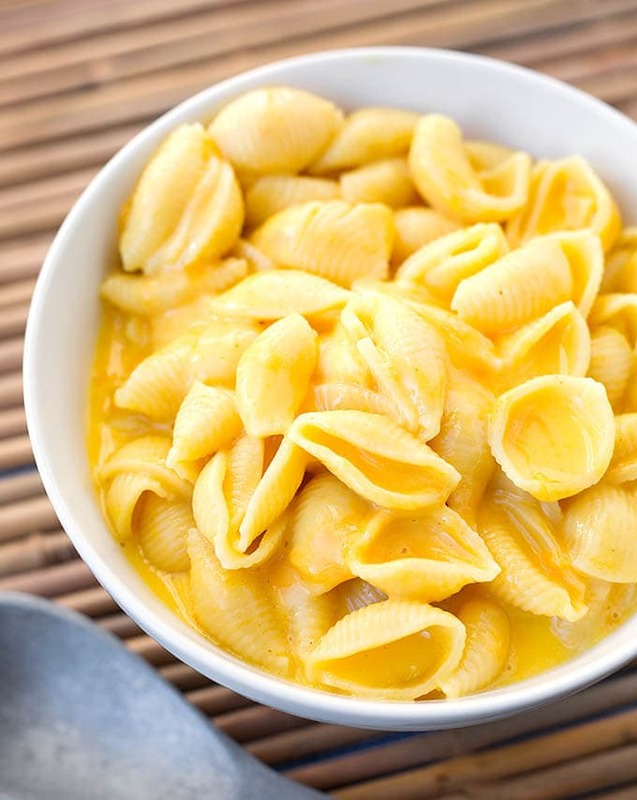 A simple recipe that makes a modest 3 1/2 cups of creamy-cheesy goodness. 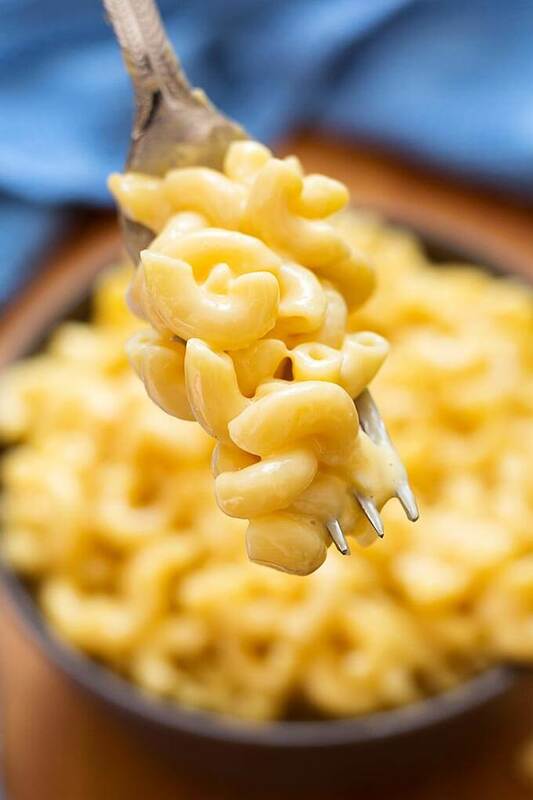 Instant Pot Mini Mac and Cheese is a creamy delicious mac and cheese made in your 3 quart Mini electric pressure cooker. Makes 3.5 cups. Turn on the Sauté function and pour the water/broth into the inner liner of the Mini. Stir in macaroni and close the lid. Set the steam release knob to Sealing. Press the Pressure Cook button and then the + or - to choose 4 minutes (check the package directions of the type of pasta you are using and use half the time it calls for). When cook cycle ends, do a controlled Quick Release of the pressure. Go a little slow at first, in small bursts, to make sure only steam comes out. Make sure no sauce is going to spew out with the steam, then open it all the way. When the pin in the lid drops, open it up and stir the pasta. Some pastas don't absorb as much liquid as others, so if it looks like there is too much liquid, take some out and reserve it. Add the cheese and stir well, letting it melt. Stir in the heavy cream/milk. Taste and adjust salt, if needed. Let it sit and cool for a few minutes, and it will thicken up. If it looks too thick, stir back in some of the reserved cooking liquid, or a little more cream/milk. Hi Kaye! Or should I say, neighbor! I think most of the recipes can be safely halved. Cooking times may vary, mostly only if the thickness or density changes due to a thinner cut of meat, or less cheesecake filling in a pan, etc. Some soups I leave more than half of the water in, I just go by the individual recipe. Have fun with your Mini! My mini is due to be delivered today and I can’t wait! I, too, just got a mini because hubby eats a totally different diet so I just cook for myself. Did just got my Instant Pot Mini Plus and this was my first recipe to try! Very tasty! I’ll for sure make it again. I left it on “ Keep Warm” for about an hour, without stirring it very much, which did cause the cheesy sauce to stick to the bottom of the inner pot. When do you advise using the keep warm setting? Hi Sue, I don’t advise using the keep warm for pasta in the IP. Possibly using the ceramic coated insert and adding a bit more milk would help if you have to use it. This mac & cheese is absolutely delicious! Glad you liked it! Thank you for the review! Hi Brad! Agreed. I’m working on some more. Stay tuned! You can subscribe to my email list to get updates, if you’d like. Just scroll to the sign up form. If you are on a desktop, it’s on the right side of the page. Just got my mini yesterday and this is the first recipe I’ve made! It turned out great!! Hoping this is the beginning of a long beautiful relationship with my instant pot! We are a 2-person household – retired – so I opted for the mini. The recipes for 2 are just what I need. Made red beans and rice the other night, and I confess, I probably did overload the thing. Thankfully it did not explode or anything, but I will not be doing that again. That’s great, Betsy! I’m glad you like the smaller recipes. I am working on more of them! For 3 quart instant pot, please! Hi Carolyn, I hear you and will be posting more soon. Sign up for updates so you can get notified when I post a new recipe! Would love more mini recipes! Made this as directed but bottom burned . Mini pit alerted me.. suggestions for next time? Hi Irma, I’m sorry you got that darn burn message. If you made the recipe as I wrote it, I don’t really know what to tell you. Maybe try low pressure next time and it won’t get as hot. I have heard that some pots are getting hotter than others. Also, make sure the cheese goes in after the pressure cooking. If it happens again, you may want to contact IP company. Thank you for letting me know. Sorry that happened. Perhaps the pot did not seal properly and steam escaped, reducing the moisture level in the pot. Or, something may have been measured improperly. This is a foolproof recipe. Perhaps you can try again. Sandy, can you please tell me where I can get assessories for the mini pot? Everywhere I look, sends me to the bigger pot assessories. I am super excited to try this recipe, but my instant pot has mutiple warning stating that I should not cook noodles using the pressure setting. Should I be concerned about it? Hi Paige, the company has to warn you for liability and such. As long as you follow the recipe directions, it will be fine. Some foods produce a lot of foam under pressure: Beans, Pasta, Apples, etc. If you add some fat (butter or oil) while cooking, it helps knock it down. When you do the quick release of the steam, feather it open and closed until you are sure no sauce will come out with the steam. That is the biggest mess when that happens! Thanks for this recipe! I made it using what I had on hand–egg noodles and half-and-half instead of the elbow noodles and heavy cream. I measured everything on a scale, so the proportions of water to pasta worked out great. My pasta didn’t cook in four minutes, so I reset the pressure cooker for zero minutes with a QPR and they were perfectly cooked. I added about an eighth of a cup of water after everything was mixed together for a slightly thinner sauce. For a quick meal, this was great! Hi Lynda, I’m so glad you liked it! My rule of thumb for cooking pasta is half the time that the package directions calls for. That usually works. I’m glad the zero minutes worked for you to get it done. I like to cook my broccoli that way! I appreciate you taking the time to leave a review, and enjoyed reading how you made this recipe! And food scales rock! I’m a newbie to the IP world and this was my first dish. OMG!!! this was sooo good!! 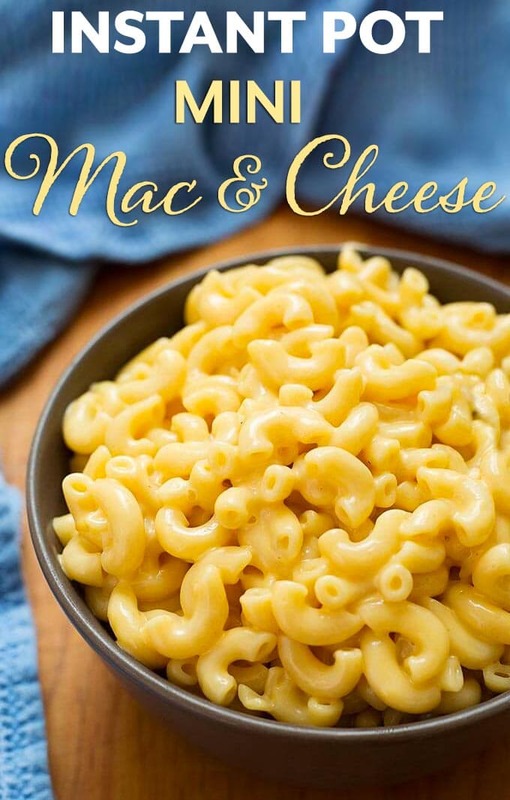 I love mac and cheese and have always wanted to make homemade, but always seemed to be so much work. I did what you said about the timing so cooked mine for 5min. Came out perfect! I love heat so I added diced pickled jalapenos and jalapeno garlic, Thank you!!! Hi Lynnley, I’m so glad you liked this mac and cheese recipe! It’s such a great go to meal. Enjoy your IP, and thank you for your review! Do you think I could safely double the recipe and it will still fit in the 3 QT? or at a minimum do 1.5x? Hi Debra, I would first try 1.5x and see how full it gets. Be sure to do a controlled quick release so you don’t have cheese sauce spray out with the steam! So glad I came across this recipe! I’ve had a 3qt IP for a few months, but haven’t done much with it aside from spaghetti and some soups. I made my first batch using the sharp cheese and evaporated milk, but found it was somehow bitter tasting. Just made this in using mild cheddar and skim milk, and it’s pretty much perfect! I think I could add more flavor somehow, but not too sure of what I need just yet. The hot sauce and mustard seem intriguing, but I’m a bit weird and just cant picture how that will taste 🙁 But definitely putting this recipe into my files for later! Came together easy for this disabled chef! Hi Rebecca! Sharp cheese can be a little strong for some folks. A medium cheddar has a nice flavor. I often use half Monterey Jack as it’s very creamy. You can even throw in some cream cheese, if you are feeling indulgent! I sometimes like to add some seasoned salt, like Johnny’s, and that takes the flavor up a notch, as does a few drops of hot sauce. The dry mustard adds a sort of tart brightness, but if you are unsure, maybe only use half the amount the first time. I’m glad you like this recipe, and can play with it and make it your own! Thank you for your review! My wife had to work late so I am trying this recipe. I figure to get up some spam to go with it. I did like the idea of adding a bit of broccoli, or bacon, or even lobster to make it fancy, but tonight it’s pretty much as written. I did make a few mods: I added both mustard and hot sauce. We like deep flavors. I used a bit more than 2cups pasta (cavatappi) because that’s what was left in the cupboard. Along with the cheddar, I added about a quarter-cup of mozzarella shreds, (again, that’s what was left in the fridge.). And to add a touch of earth tone, I used half plain you very and half milk. I think it’s pretty darn good. I hope she likes it too! Sounds good, hope she likes it! Getting small pot today , can’t wait to use it! Just made this and it turned out great. Very good flavor…opted for the mild cheddar. Thank you for sharing you recipies. Can I make these recipes in the six quart instant pot also without altering? I recently purchased the six quart duo and sometimes don’t need a bigger quantity. Yes you can, as you’ll use 2 cups of liquid. I actually doubled the recipe in my mini and it worked perfectly. I added 50% more cheese and ~2 tsp of garlic powder. Easily the best mac I’ve ever made. WIN. This is a great recipe. It was delicious! I finished it off with panko bread crumbs and bits of butter and browned it under the broiler. This will definitely become a regular in my dinner rotation. Thanks for the recipe. Sounds great! Thank you for your review! We followed this recipe exactly and it was DELICIOUS! This is the best homemade mac and cheese I’ve had. We will definitely make this again (and again). That’s awesome, Karli! I’m so glad this recipe was a hit for you! This was delicious. I followed your directions to the “T.” I added the dashes of hot sauce and ground mustard. After cooking, I added more pepper as that’s how I like things. Excellent recipe. Very easy to follow and very fast! Thanks! I made this and used 1 cup shredded white cheddar cheese and 1/4 cup shredded Gouda cheese. I also needed more milk, I used about 2/3 a can of evaporated milk and topped with a sprinkle of dried breadcrumbs. It was a hit! Perfect size for 3 of us plus a side of broccoli for a dinner. Thank you! So I bought the mini pot and love it. We too are downsizing which is hard when you are accustomed for cooking for a crowd. Life happens! I still use the 6 qt for many things but this 3qt is great. Also bought the ceramic nonstick pot which is great for this recipe and any cheesy, sticky recipe. Used colby jack cheese….great melting cheese & evap milk, which I always keep on hand ( you never know when a snow is going to keep you in), a little cayenne too. Lots leftover. What’s the best way to reheat M&C? Tried several ways but it always seems to curdle. Any suggestions? Thanks for your reply & great recipe for the 3qt. Hi PattiAnn, I understand the whole downsizing thing. We’ve been slowly doing it, too. Reheating mac & cheese is tricky. Before you put the leftovers in the fridge, try adding some milk to help it stay creamy. If you reheat in the microwave, do so on 50% power and stir halfway through. That’s how I do it. There may be a better, slower method, but I’m impatient and want it fast!